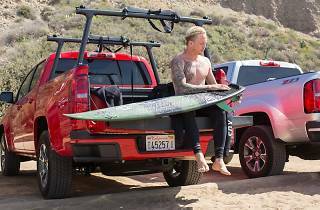 There are different names for it, but the premise is the same, and it's one that's unique to California: Surf the coast in the morning and be up in the snow by afternoon. We're incredibly lucky to live in a city that affords us some of the best beaches and most beautiful mountain ranges, both within a half-day's drive. But until this week, a sea to summit trip was just another embarrassing thing we'd never done in LA, despite having lived here for years and loving the coast, the mountains and adventure of any sort. It's always been a dream of ours (of every Angeleno, we're sure), so when Chevy invited us on a California Double road trip, we couldn't say no. 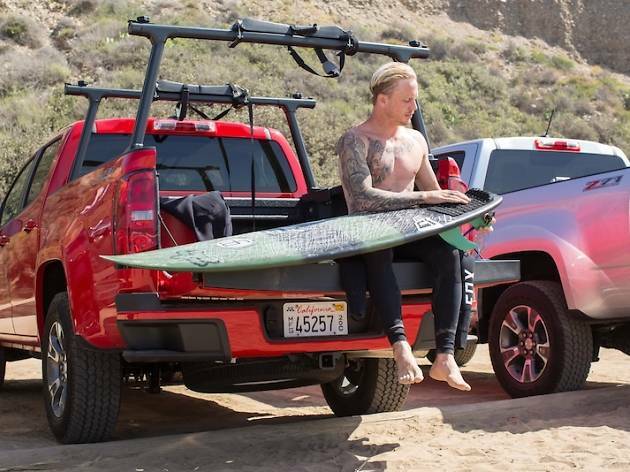 We'd spend Monday morning in the water with one of FoxHead's pro surfers, Chippa Wilson, and then drive up to Big Bear in Chevy's new Colorado trucks to ski and snowboard the next morning. These, friends, are the perks of this job. And the perks of living in the best city in the country, of course. We don't have to tell you how great it is to spend the morning surfing (er, mostly wiping out) and sunning on the beach. Throw in a sweetheart surf celeb and some tacos for lunch, and the day was pretty much golden already. When our caravan left for Big Bear, we realized that sitting in LA traffic just isn't so bad when you're road tripping from the beach to the mountains. It was also not too shabby to be in a brand-spanking new truck with tons of space for our gear. Ideally, the second leg of the Double includes snow. Unfortunately for us, the mountain had closed two days before our arrival (the drought is real, guys). But we decided that it was still pretty great to be at high elevation surrounded by pine trees and pretty lakes, and planned on a hike the next morning. As we headed to dinner, we realized that a mountain town with no snow in early April meant no crowds, no wait time at the bar, plenty of open lanes at the Bowling Barn (Chippa, it should be noted, should stick to surfing) and a very open mic at karaoke. After nursing some slight hangovers at breakfast on Tuesday, we embarked on our hike. And it did feel pretty special that just 24 hours ago we were playing in the surf. It also felt pretty damn convenient to know that the only thing between the two was a three-hour road trip (and one too many beers—but not at the same time). The California Double was a big one on our LA bucket list, and crossing it off in the company of FoxHead and Chippa was quite the experience. Kate’s wanderlust is (mostly) satisfied by the sparkling sprawl of cities across the world, and though she often makes a break for the mountains, desert or coast, exploring the streets of a new metropolis is her favorite part of every trip. Follow her on Instagram @kate_em_up.